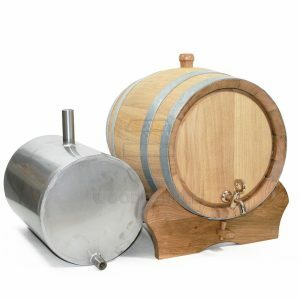 Unlike the traditionally made barrels with stainless steel flask don’t require any particular of storing them while not in use. 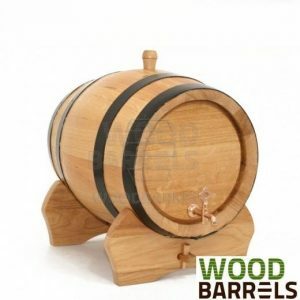 Oak barrels give that traditional, rustic look, while stainless steel insert is hygienic and easy to clean, thus making any wooden barrel with stainless steel flask perfect for pubs and bars as well as the parties. 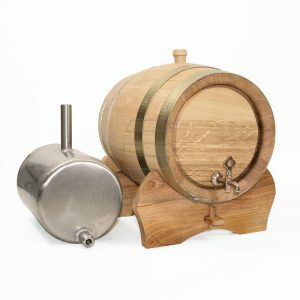 Looking forward our customers expectations, we have made product practical in domestic use -2 Litres Cocktails Serving Barrel with 1litre stainless steel flask. Unlike traditional barrel, these ones are fitted with stainless steel flask. That makes them easy to clean -just rinse off and the keg is again ready to be filled up with another drink, as metal flask doesn’t absorb the drinks’ flavours, so it doesn’t transfer them to the others. Apart of its inside, the outside is still traditionally made solid oak keg. Every cask has four standard galvanised steel rings, brass tap and is complete with a wooden stand and bung. Looking forward our customers expectations, we have made product practical in domestic use -5 litres barrel with 3.5litres stainless steel flask. Unlike traditional barrel, these ones are fitted with stainless steel flask. That makes them easy to clean -just rinse off and the keg is again ready to be filled up with another drink, as metal flask doesn't absorb the drinks' flavours, so it doesn't transfer them to the others. Apart of its inside, the outside is still traditionally made solid oak keg. Every cask has four standard galvanised steel rings, brass tap and is complete with a wooden stand and bung. Looking forward our customers expectations, we have made product practical in domestic use -10 litres barrel with 5 litres stainless steel flask. Unlike traditional barrel, these ones are fitted with stainless steel flask. That makes them easy to clean -just rinse off and the keg is again ready to be filled up with another drink, as metal flask doesn't absorb the drinks' flavours, so it doesn't transfer them to the others. Apart of its inside, the outside is still traditionally made solid oak keg. Every cask has four standard galvanised steel rings, brass tap and is complete with a wooden stand and bung. Looking forward our customers expectations, we have made product practical in domestic use -15 litres barrel with 10 litres stainless steel flask. 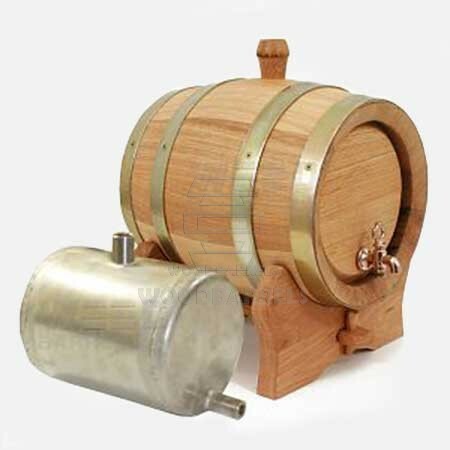 Unlike traditional barrel, these ones are fitted with stainless steel flask. That makes them easy to clean -just rinse off and the keg is again ready to be filled up with another drink, as metal flask doesn't absorb the drinks' flavours, so it doesn't transfer them to the others. Apart of its inside, the outside is still traditionally made solid oak keg. Every cask has four standard galvanised steel rings, brass tap and is complete with a wooden stand and bung. Looking forward our customers expectations, we have made product practical in domestic use -20 litres barrel with 15 litres stainless steel flask. Unlike traditional barrel, these ones are fitted with stainless steel flask. That makes them easy to clean -just rinse off and the keg is again ready to be filled up with another drink, as metal flask doesn't absorb the drinks' flavours, so it doesn't transfer them to the others. Apart of its inside, the outside is still traditionally made solid oak keg. Every cask has four standard galvanised steel rings, brass tap and is complete with a wooden stand and bung. Looking forward our customers expectations, we have made product practical in domestic use -30 litres barrel with 20 litres stainless steel flask. 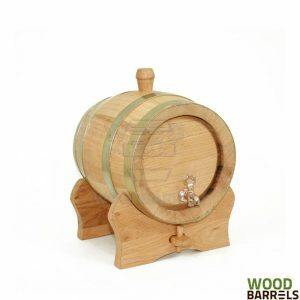 Unlike traditional barrel, these ones are fitted with stainless steel flask. That makes them easy to clean -just rinse off and the keg is again ready to be filled up with another drink, as metal flask doesn't absorb the drinks' flavours, so it doesn't transfer them to the others. Apart of its inside, the outside is still traditionally made solid oak keg. Every cask has four standard galvanised steel rings, brass tap and is complete with a wooden stand and bung.